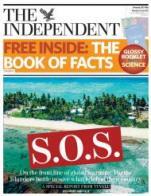 The Independent leads with yet another climate change related front page about how climate change is ravaging Tuvalu in the South Pacific. “For Tuvalu, reports the paper “a string of nine picturesque atolls and coral islands, global warming is not an abstract danger; it is a daily reality. The tiny South Pacific nation, only four metres above sea level at its highest point, may not exist in a few decades. The outlook is bleak. A tidal gauge on the main atoll, Funafuti, suggests the sea level is climbing by 5.6mm a year, twice the average global rate predicted by the UN’s International Panel on Climate Change (IPCC). There is not enough data yet to establish a definitive trend but that figure is alarming, implying a rise of more than half a metre in the next century. Most Tuvaluans live just one to two metres above sea level. Funafuti’s tranquil lagoon is adorned by a necklace of cream islets, each one tufted with dense vegetation. There used to be seven. Now there are six. The other one disappeared after a series of cyclones in the late 1990s. First, the palm trees were stripped off, then the sand, then the soil beneath. All that remains is a forlorn scrap of rubble, visible at low tide. It is an ominous indicator, in miniature, of what awaits Tuvalu’s larger, populated islands.